The ESA Council, chaired by Jean-Yves Le Gall, met on 17–18 October in Paris, France. An Agreement between NASA and ESA on ExoMars 2020 was unanimously approved to include NASA’s Deep Space Network in the mission’s ground segment and to extend Mars proximity relay communications using NASA’s MRO and MAVEN orbiters. 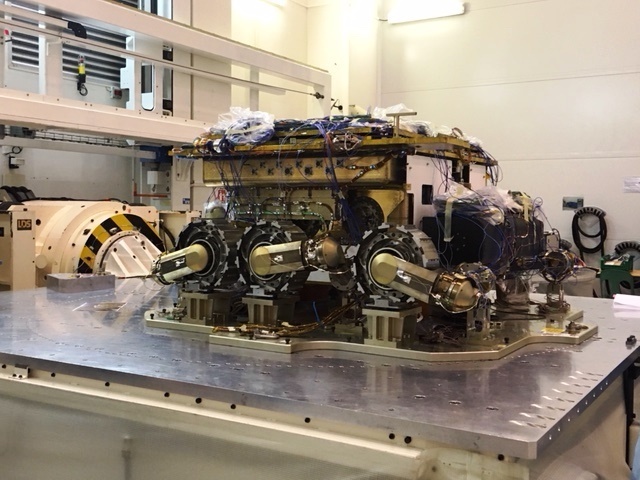 Delays of 2–10 months have accumulated on the Rover Pasteur payloads since Ministerial Council 2016 with respect to Lead Funding Agencies’ commitment. This was addressed with the relevant Member States on different occasions. The System Rocket Complex PDR was held in June allowing the consolidation of the spacecraft and combined operations activities plan at Baikonur. Following the consolidation by Lavochkin and Thales Alenia Space Italy of the Descent Module and the Spacecraft Composite AIT activities and because of a longer launch campaign than initially assumed, Thales and Lavochkin were requested to propose an updated schedule that preserves 60 working days of contingencies two years prior to launch. A proposal for a simplified Rover wheelwalking mode is expected from Airbus Defence & Space UK to improve the overall compliance to the locomotion requirements on critical terrains. Anatoly got one detail wrong: "Planetary Defense" is protecting from asteroid. Protecting from bacteria, which is what I assume the ExoMars lander needs to do is "Planetary Protection"
The CDRs of the Carrier, Rover and Descent Modules (DM) are ending. Some equipment belonging to the Carrier and Rover Modules encountered difficult development that required close monitoring, lengthy tests and adjustments of design. The second phase of the DM CDR jointly conducted by Roscosmos/TsNIIMash and ESA is ongoing with emphasis on hardware design readiness, specification of software requirements and final analysis of the braking engine/Radar Doppler altimeter plume interference risk. The system CDR is planned for 26 October. An updated ExoMars 2020 project schedule is being created to reflect a full-fledged DM and spacecraft test campaign, introducing 60 working days of contingencies, and assuming a realistic 66-day launch campaign. The video features footage taken of the parachute deployment as seen from the ground, as well as from onboard GoPros fixed to the drop test vehicle and looking up at the parachute. The test focused on the deployment and inflation of the second main stage 35m-wide parachute, which will be the largest to fly on Mars. Discussing the test are Stephane Langlois, ESA ExoMars engineer, and John Underwood, principal engineer at Vorticity. The test was carried out by Vorticity Ltd under the supervision of Thales Alenia Space France, Thales Alenia Space Italy and ESA, in Kiruna, Sweden, on 2 March 2018. It's good to see ESA's pulling off their own accomplishments for Mars. My main concern is how the Russian platform is coming together; Russia's rockets are trustworthy but (at least for Mars) their spacecraft have lacked in success even in the Soviet era. I do hope with ESA they can pull this off. Good to see it coming along. It is also a small bonus from that article to learn the decision between the sites of Oxia Planum and Mawrth Vallis will be made in November. I wish for more news on the Russian components. A representative model of the ExoMars rover that will land on Mars in 2021 is beginning a demanding test campaign that will ensure it can survive the rigours of launch and landing, as well as operations under the environmental conditions of Mars. a couple of weeks ago I was riding my bike just outside the Intespace premises here in Toulouse and I noticed in their "shipping crates lot" a crate marked "Exomars Rover"
Rover test: What's it like to ride a rocket to Mars? So, if you spend a billion euros on a space mission, you better be sure it can survive the rocket ride off Earth. If the rocket is called Proton, the answer to the question is: quite scary. ◾The name can be a single word, a short combination of words, or an acronym. ◾It must not have been used for a past, current or proposed space mission. ◾Ideas should be accompanied by an explanation of no more than 150 words. ◾If a person's name, that person must have died on/before 10 October 1993. ◾The search website will close to entries at 23:59 BST on 10 October 2018. ◾A UK Space Agency expert panel will choose the best suggestion. ◾The winning entry will earn a tour of the Airbus factory building the rover. ◾Think hard! Only one name suggestion will be accepted from each entrant. Are Americans allowed to make suggestions? Their list for country of residence is all Europe...plus Canada...but not the United States. (b) members of the immediate families or households of (a) above. 5.2 The Member States and associate members of the European Space Agency are: Austria, Belgium, Canada, Czech Republic, Denmark, Estonia, Finland, France, Germany, Greece, Hungary, Ireland, Italy, Luxembourg, the Netherlands, Norway, Poland, Portugal, Romania, Slovenia, Spain, Sweden, Switzerland and the United Kingdom.